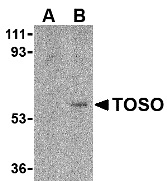 Western blot analysis of human lung lysate probed with Rabbit anti Human TOSO (AHP1183). Rabbit anti Human Toso antibody recognizes the C-terminal (CT) region of human Toso, also known as Fas Apoptotic Inhibitory Molecule 3 (FAIM3). Toso is expressed by lymphoid and haematopoietic cells and is up-regulated by T-cell activation. Toso expressing cells have increased resistance to Fas-, FADD-, and TNFalpha-induced apoptosis. Toso is membrane bound, and is thought to directly bind to FADD, disrupting DISC formation and thus inhibiting caspase-8 activation. Toso is a potential proto-oncogene, and could be a therapeutic target for use in the treatment of autoimmune diseases. Despite its predicted molecular mass of ~30-44 kDa, Toso often migrates at ~60 kDa in SDS PAGE. AHP1183 detects a band of approximately 43kDa in human lung tissue lysate. Hitoshi, Y. et al. (1998) Toso, a cell surface, specific regulator of Fas-induced apoptosis in T cells. Song, Y. & Jacob, C.O. (2005) The mouse cell surface protein TOSO regulates Fas/Fas ligand-induced apoptosis through its binding to Fas-associated death domain. J Biol Chem. 280 (10): 9618-26.